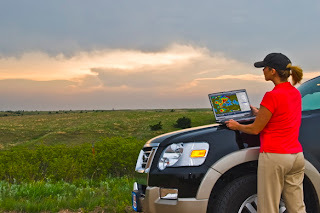 MSE Creative Consulting Blog: How Did Storm Chasing Begin? How Did Storm Chasing Begin? Tonight's episode of Storm Chasers on Discovery is supposed to be an especially good one. It premieres at 10 Eastern/9 Central. Joel Taylor posted on Facebook that the Bowdle, SD wedge tornado will be shown. He says it is the most spectacular tornado ever telecast on the series. Have you ever wondered how storm chasing started? I tell the story for the first time in Warnings. I was present in Felgar Hall at the University of Oklahoma when it was first proposed. Chaser Katie Bay reporting the storm so a warning can be issued while simultaneously photographing it. Greenleaf Book Group, Warnings' publisher, has created a Facebook page about the book. And, if you would like to read the first chapter of Warnings, click here. Even today with Doppler radar, chasers and spotters play a vital role in the warning process. UPDATE: 10:05PM. Tonight's was -- by far -- the best episode in the series. A tremendous tornado and much less of Sean/Reed "drama." Keeping in mind this is reality TV, there is a lot of creative editing. You see very dramatic photos of metal power transmission towers falling, a rare site. But 34 minutes into the program look to the left of the tornado. A toppled tower magically resurrects itself. UPDATE II: 10am Thursday: If you want to see still photos and radar imagery of the giant tornado featured in last night's Storm Chasers click here. Good News: Global Warming Saves Lives, Literally! Yes, But Were They Flying First Class or Coach? What is the Real Agenda? Did a Tornado Hit Baltimore Tuesday Night? Enthusiasm for Wind Energy Calming? The "Best Umbrella in the World"
Talk About a Pattern Change! Happy 5th Anniversary Jersey Boys!